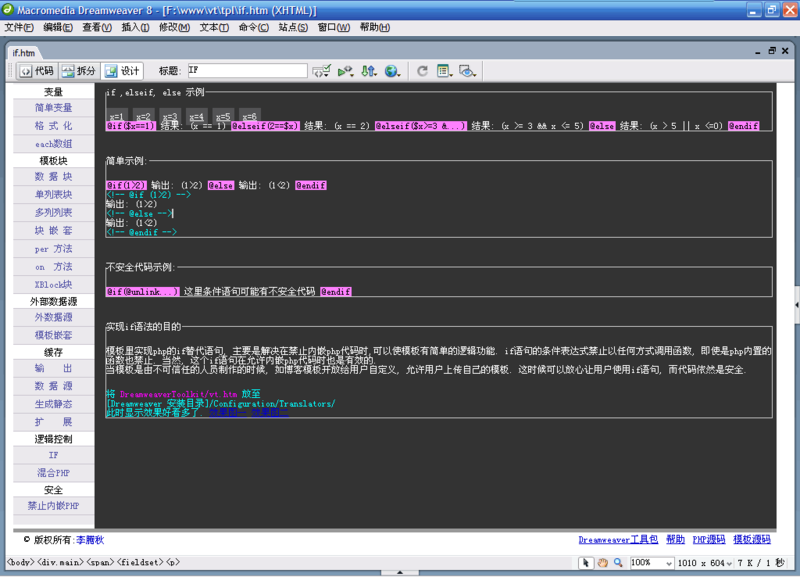 例一: VT警告: 危险的表达式 @unlink("tpl_c/test.php") ! 表达式可能调用不安全函数. 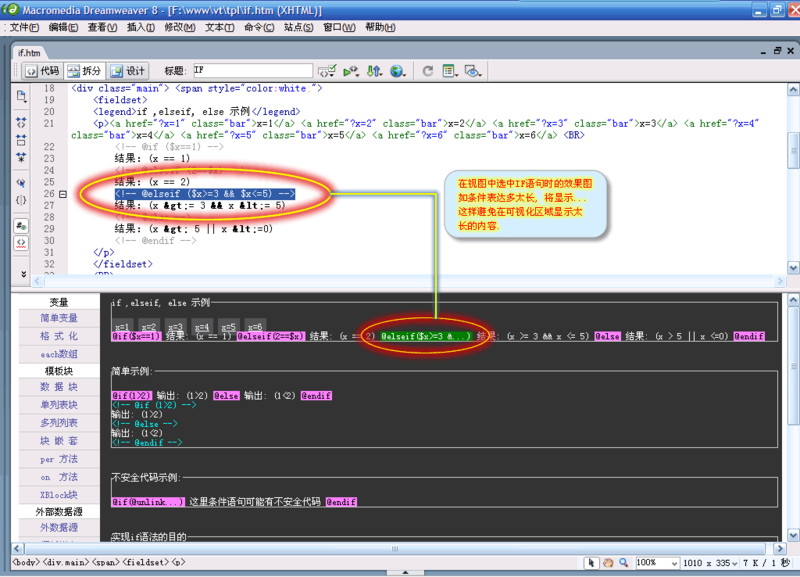 例二: VT警告: 危险的表达式 include 'tpl_c/test.php' ! 表达式可能调用不安全函数. 例三: VT警告: 危险的表达式 MyClasss::is_int($mm) ! 表达式可能调用不安全函数. 模板里实现php的if替代语句, 主要是解决在安全模式下, 可以使模板有简单的逻辑功能. if语句的条件表达式禁止以任何方式调用除常量VT_SAFE_FUNCTIONS中以外的函数. 当前值: abs,array,base64_decode,base64_encode,bindec,ceil,chr,count,date,empty,explode,floatval,floor,hexdec,htmlentities,htmlspecialchars,implode,in_array,intval,is_array,is_bool,is_float,is_int,is_nan,is_null,is_numeric,is_object,is_resource,is_string,isset,ltrim,max,min,ord,preg_grep,preg_last_error,preg_match,preg_match_all,preg_quote,preg_replace,preg_split,rand,round,rtrim,str_repeat,str_replace,str_split,stripos,strlen,strpos,strtolower,strtotime,strtoupper,strval,substr,time,trim,urldecode,urlencode, 即使是php内置的函数也禁止. 同时也禁止载入其他文件.